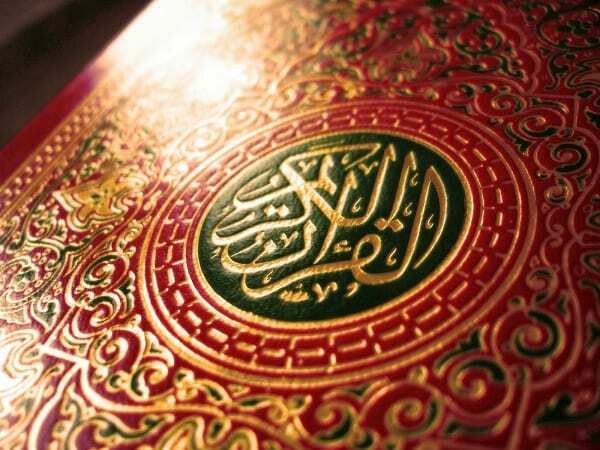 When was the last time you read the Qur’an cover to cover? Is your Qur’an accumulating dust since last Ramadan? Have you ever made the intention to read portions of the Qur’an with translation each day, gave it a go, but then got distracted? So imagine a group of about 40 Muslims — family, friends or colleagues — encouraging and motivating one another to read small portions of the Qur’an along with its translation each day on WhatsApp, Hangouts or any other instant messaging (IM) service that allows group messaging. Yes, you read that right! As much as I used to find these apps a distraction, as with most things, when used in the right way, they work very much in our favour and are a great example of how we can use technology to enhance our spiritual productivity. The focus, devotion and aim of this group is to take a proactive approach to reciting the Qur’an daily. Imagine the reward, the barakah (blessings) and the feeling of being part of an amazing circle of Muslims who not only motivate you, but are connected to you daily solely for the purpose of getting closer to the Holy Qur’an. How does it work, I hear you say? Let me break it down so you can set one up for your family and friends and fill your life with Qur’an each day, In sha Allah. The aim of the group is to motivate one another to complete a full recital of the Holy Qur’an in Arabic and its translation from beginning to end over a period of time. 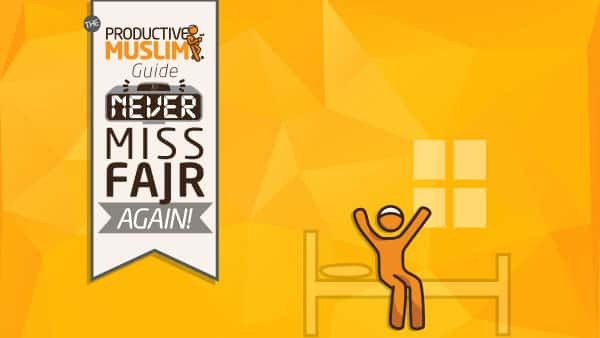 Some of the objectives include reflecting on Allah’s words and signs, deepening our connection with the Qur’an, improving our fluency and recital with tajweed, self-satisfaction, affecting a cure for oneself from any malaise, a softening of the heart, unity of brotherhood or sisterhood, among others. A phone with access to WhatsApp, Hangouts (or other preferred app/service). A beautiful invitation message that you can send out to family and friends. A determined admin — you may have more than one or share responsibility. Family and friends to be invited, who have access to one of these popular IM services. The number of ayaat (verses) to be sent each day can vary from ¼ of a juz’ to approximately 20 ayaat each day. These ayaat should also be displayed in the group subject line, for e.g. ch 2: v 224–242. Group members have until the following Fajr to complete the recital. If only the Arabic is read by a member, they post a thumbs-up. If only the translation is read, they also post one thumbs-up. If both Arabic and translation are read, they post 2 thumbs-ups. The administrator sends words of encouragement and motivation throughout the day including the benefits of reciting the Qur’an. Any comments to be made should be made to the administrator only. Positive encouragement: Comment on the thumbs-up and number of thumbs-ups to encourage others to continue in the group. Post reminders of the importance of the Qur’an through ahaadēth and ayaat from the Qur’an itself. 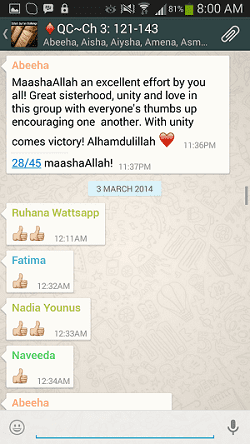 Lessons learnt: Occasionally ask group members to post one lesson they have learnt from the verses read. Performance: Everyone likes to know how well he/she is doing, so make a special mention to those who have managed to keep up with the challenge at the end of each week. Send a gentle reminder privately to any group members who have not posted their thumbs-up for a while — you will be surprised at how pleased they will be with this individual encouragement. Before I set up the group for my family and friends, I had the honour of joining a group of about 50 devout sisters who live in Saudi Arabia. Masha Allah, their group, several months old, is now reading from Chapter 4 of the Qur’an, Surah An-Nisa-a. Once I joined them, I felt so privileged to be part of such an amazing group. I was constantly reminded and motivated by the wave of thumbs-ups, indicating that they have read their portion for the day. I thought to myself, what amazing sisters; so much daily dedication and devotion to the Qur’an! So I felt I needed to encourage and motivate others around me to join me in a new Qur’an Challenge group, especially as I had not started from the beginning and needed to catch up with the sisters in the group. So I began sending messages inviting my friends and family to see if they were interested. The group rose to 13 sisters on the very first day. Everyone was made aware of the rules, joined willingly and were very excited too. By the next day, my friends had told their family members and other sisters and, Masha Allah, the group now consists of 45 sisters. With 45 thumbs-ups being sent throughout the day, that has got to encourage one to dust off one’s mus’haf and start reading. Completing three ajza’ of the Qur’an within a short span of three weeks has been a massive achievement for the group itself. However, the group effort has been a huge motivational factor at an individual level too. Being connected to one another via the Qur’an has even encouraged a sense of belonging, Masha Allah. Managing the group has been tough and tricky at times, especially when I have been busy with my day-to-day activities. To help with things, I nominated a volunteer from our group to help me manage and motivate us throughout the day, Alhamdulillah. As admins we need to constantly think of ways to motivate the group with quotes, videos, powerful ahaadēth etc. We may also have to remind members to respect the rules where they are to post only thumbs-ups as a means of encouragement and refrain from posting forwarded messages or promoting other events. The recommendation is to contact admins only privately for anything. However, we did want to hear from our group members. So we created a survey to find out whether they were enjoying the challenge and if there was anything else we could do to motivate one another better. Alhamdulillah, the feedback has been very positive. Although we have not achieved a full house where all members have read each days’ portions completely — and this remains a goal for the admin — we are grateful for the fact that we do indeed catch up with the reading and are determined to continue with the challenge, In sha Allah. This productive way of bringing the Qur’an back into our lives daily using everyday technology has surely added a sense of barakah and tranquillity to our busy lifestyles, Masha Allah. So start humble, give this fun and productive Qur’an Challenge a try, and share your thoughts and experience with us in comments below. Umm Ammarah has a passion for teaching, studying the Holy Qur’an and motivating others around her can-do approach. She has a background in religions and primary education. She is passionate about travelling, creativity and productivity. Currently, she is a homemaker and a mother of one child. Additionally, she is enthusiastic about homeschooling, blogging and seeking Islamic knowledge. Watch out for Umm Ammarah’s upcoming blog that she’ll start upon moving to Makkah, In sha Allah.